Chairs of this general style have many names. Slat Back or Ladder Back are two of the most popular designations. Today, they are most commonly attributed to the Shakers, but they were made by many cabinetmakers and turners. Their designs were as varied as the number of builders, each of which had its own design. The general styling - and the shape of the slats - was also influenced by regional tastes. Some were very plain and straight, while others featured very ornate turnings. 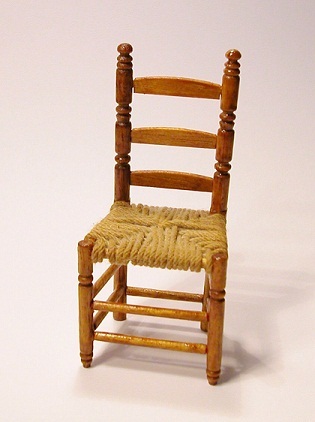 The seat were almost exclusively woven, either with rush and cane or with brightly-colored woven tapes. The Shakers were the largest producers of these chairs during the peak of their existence - supplying not only their own needs but also selling them to others outside of their world. The wood used in the chairs sold outside the Shaker world was more common, e.g., maple and birch, than that used in the chairs for their own use. The slats in those made for themselves were often made of curly maple, burl wood or other exotically-grained wood. This and the Windsor chair are the two most popular chairs of the Colonial period. The miniature I have is made of a 'The House of Miniatures' kit. The chair is colored/finished with Shellac. The seat is white cord - also colored with Shellac.